Melee Necromancer is a great build to start playing untwinked, thus it may be your very first MXL build. Endgame he doesn't require having ultimate super rare gear to successfully complete 85% of all ubers and challenges. In this guide I'm trying to cover all the bases considering the Melee Necromancer and give you detailed information which you will use when trying this build for the first time. Melee Necromancer is both a great uberlevel farmer and excellent in getting charms since he has a variety of skills to use to his advantage. As mentioned above, this build can be easily played untwinked using differnet ways to annihilate enemies in regular game. Our survavibility usually lies in having high life leech (LL), high defence (TCD), avoid to sustain incoming damage and in dealing massive damage to destroy monsters before they have a chance to get you. Thus, we can choose between offensive and defensive playstyles. Finally we can choose between going full-strength or full-dexterity weapon-damage modifier build (WDM) or playing as a procmancer who relies on spell damage. See what suits you most and pick your poison! Effect: Creates a transparent wall that greatly increases all damages when passed through. Effect and wall duration are increased with each new level gained. Comment: In most times this skill will be on our RMB as if it very effective both early- and endgame. Effect: Multiple rapid melee attacks. Gains bonuses per every soft point. Comment: Great skill early game before you get an access to Parasite. Also, the bread and butter of a procmancer build. Leave at 1 hard point. Effect: Leap attack that deals massive poison damage. Gains poison duration per every hard point. Comment: Excellent skill to deal with bosses that don't have poison immunity and, what is most important, the source of 'last-hope survival' which can come in handy in uberlevels. 1 point is enough because increasing poison duration is not worth spending hard points. Effect: A passive that grants life leech and increases damage. Comment: This skill is crucial for surviving if you're using Parasite as the main attacking skill, thus we need to put maximum points here. If you've chosen Whirlpool, put 12-18 points. Effect: Melee attack that leaves a projectile that bounces between enemies numerous times, dealing weapon damage (50% of physical weapon damage is converted to magic damage). 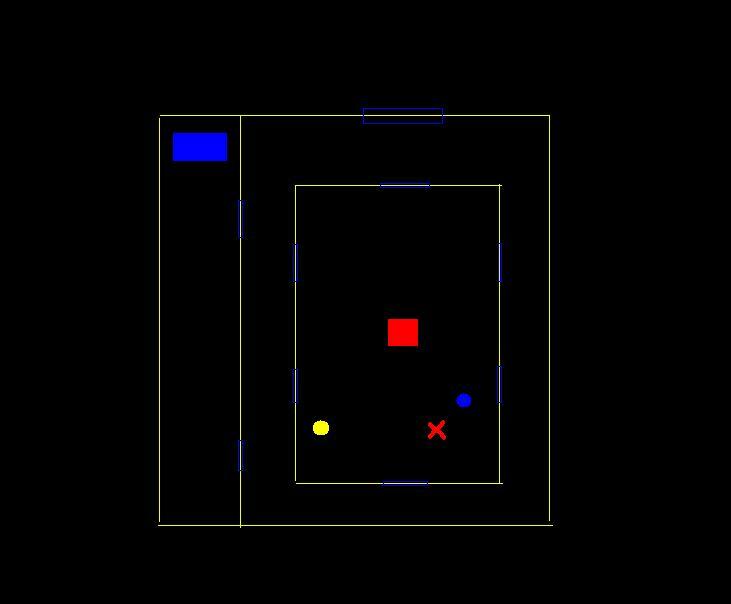 Each hard point you put in this skill will allow the projectile bounce more times. Comment: One of our main skills that we will use throughout the game. Each projectile will leech life and also trigger 'on striking' procs. You can put from 10 to 20 points here. Average number of hard points to have is 15 that allow to hit up to 34 enemies (or hit lesser amount of enemies multiple times). Effect: Morph that increases defence and gives flat strength and dexterity stats. Increases damage with each hard point. Locks out ranged skills. Comment: We will use our morphing ability to help us throughout the whole game (free stats will cover all gear requirements), but the total amount of hard points may vary depending on your playstyle. The more hard points you put, the more lethal your weapons will be. Endgame it will be the last skill we want to spend points into, so the average number of hard points spent here may come from 1 to maximum. Effect: A passive that adds flat fire damage to weapons (more flat damage with each hard point). Comment: If you choose offensive playstyling, you'd want to max out this skill, otherwise put 15-25 point here. Effect: This passive increases maximum life (with each hard point) and gives a huge mana regeneration boost. Comment: We cannot waste skillpoints into vitality (necromancers gain only 1 hp per point into vitality) thus we needs another way to increase our hit points. Put at least 15 points here. If you feel that you're not safe enough, choosing defensive playstyle, you may want to put maximum possible points here. We'll also supermax this skill while doing ultimate uberquests. Effect: Gives reanimates (creatures that are not affected by minion stats and are harder to control, thus in most cases their only purpose is to serve as meatshields) and %slow target. Comment: If you choose defensive playstyling, you'll need to max out this skill, as it greatly increases your survavibility. My personal choice is 0 points, but you can experiment and put here some points early game before you get your uberskill tree available. Effect: When active, automatically shoots punishers at nearby enemies, dealing massive poison damage. Comment: A classic 1-pointer. Outcoming poison damage is enough to kill most regular non-poison immune monsters instantly. Effect: Minions with an aura that reduces enemy elemental resistances. Also increases maximum fire resists on yourself. Comment: None of the effects written above can be increased without spending hard points. Furthermore, we can obtain -100 enemy pierce with some gear and charms. In all aspects of game this skill is completely outclassed by Death Ward. Effect: Enchanted minion is invulnerable and deals heavy magic damage (more damage with each hard point). Comment: There are only a few moments in game when this skill can be useful. If you have extreme patience while doing some tricky uberquests, you will never need to respec to this skill. Effect: A passive that gives a huge defence bonus with every soft point and grants avoidance per every hard point spent here. Comment: This uberskill is crucial for a Melee Necromancer and needs to be maxed out. Effect: Slow moving ball that deals massive poison damage on impact. Gains 1 additional missile per 10 levels. Comment: outcoming damage can be increased with %spell damage, -enemy resists and +skills. This proc is great to have with a procmancer build. Very common throughout the game. Effect: Multiple towers shoot arrows in a rapid fire that deal 3/4 of your weapon damage. Comment: each arrow fired from a single fortress spreads slow and triggers 'on striking' procs. Very common throughout the game. Effect: Multiple spikes that deal 2/3 of your weapon damage. A percentage of physical damage is converted into magic damage. Comment: Those spikes may either collide with a single target or spread to adjacent monsters, damaging them. Trigger 'on striking' procs. Occasionally seen throughout the game. Effect: Fireballs that dealing fire damage. Comment: outcoming damage can be increased with %spell damage, -enemy resists and +skills. Very effective proc against heroic bosses because it does not multihit. One of the most useful procs to have with a procmancer. Effect: Melee attack that creates a maelstrom that deals 1/4 of your weapon damage. Comment: This skill is a multihitting one, thus outcoming damage per second will be way higher than that displayed on your character screen. Triggers 'on striking' procs and allows you to leech life up to 100% hp from 5% in a few seconds. Can be effective in some situations. Has 2 sec. spell timer. Effect: Ranged attack that creates a rotating stationary ball unleashing multiple missiles that deal 3/4 of your weapon damage. Cannot be used with Deathlord morph. Comment: This skill is not obtainable until lategame, but can be very effective against some ultimate uberbosses if you need to apply open wounds but want to stay out of melee range. Has no spell timer and can be cast in a rapid rate, thanks to our huge mana regen from Embalming. Effect: when active, periodically creates a pool of flames. Comment: Godly skill for any type of melee necromancer build. Be sure to drink an Elixir of Power and buff yourself with Burning Veil before you cast Path of Flames. When you get Bloodlust and Elemental Totem, total fire damage after prebuffing will be incredible. Comment: Everything is simple: the more damage you deal the quickier you will kill the monsters. Our total hp is still fine enough because we have huge life leech. We lose %slow target modifier as well as some reanimates but unless you're completely new to the mod you should choose this playstyle, especially if you want to rush through the regular game. Comment: If you're using Whirlpool at your LMB all the time or decided to equip a dagger and a shield, defensive playstyle may suit you more. We have reanimates and our attacks will slow target while the damage is still high enough to destroy everything in a matter of seconds. If you want to use a dagger but not with Whirlpool oskill, sMax Famine and put more hard points into Parasite. We'll be sacrifising points from either Talon's Hold or Dragonfire Oil. Comment: If you're an experienced player who knows how the things work in MXL, you can try a procmancer build. We will be relying on high spell damage from procs and flat elemental damage from gear and some oskills. With only one hard point put in Parasite we are somehow squishy (not enough life leech) so you must proceed with caution when it comes to farming or getting charms. Endgame, you'll be sMaxing Shadows instead of Deathlord for more powerful prebuffing. Not that some quests (like Black Road Challenge) and some uberquests are almost impossible to complete with a procmancer, because full-strength WDM build is way stronger and safer to play. Comment: Going full-strength build grants you higher damage output from necromancer scythes. Also, jewels will solve all problems considering attack rating, so there's little to no need to put points into dexterity. On the other hand, daggers and normal scythes benefit from dexterity so if you shoose a full-dexterity build you'll have to put as maximum points to dex. as you can. Deathlord stats bonus will cover all our gear requirements, so there's no need to put any points into dex/str if your weapon doesn't get damage bonuses from it. As for a procmancer, feel free to put some points into energy early-to-mid game if you want. Endgame we'll be focusing on spell damage, not on energy factor so there's no need to invest hard into energy. In order to farm fast and safe, we have to reach certain breakpoints. For our build, we are looking at the breakpoints for Increased Attack Speed (IAS) and Faster Hit Recovery (FHR). 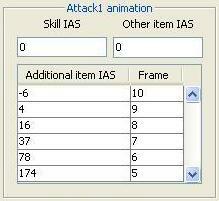 In order to distinguish IAS from FCR (Faster Cast Rate) note that the latter modifier increase amount of spells casted. Spell is an attack that has flat numbers of damage (melee spells are Wildfire, Blood Thorns etc.) while every skill that has a division value like 3/2 or 3/4 weapon damage is considered a non-spell, thus its amount casted per second depends on IAS modifier. As we are a melee build we're also looking for high values of FHR. A breakpoint is a value where our speed changes. The game speed in Diablo II is measured in frames with totally 25 frames per second (fps). As for IAS, one attack will take the whole second if we have 25 fps. Our goal is to reach 5 fps so we could perform almost 6 attacks per second. 25 fps for FHR means that after we get hit, it will take the whole second before we can move again. Our goal is to reach the same 4 fps so we could move after 0,16 seconds after being hit. If you cannot afford maximum value endgame, try to get at least 86% FHR and 78% IAS to feel safe in all uberlevels. This is achievable with crafted jewels and some gear. Before we start, I suggest you to carefully read MXL Documentation if you're not familiar with most new things implemented in the mod! Our first action will be buying a Raptor Scythe from Charsi. Right click your Signet of Gold to obtain gold, buy any of raptor scythes available and go to Blood Moor. Prebuff Burning Veil and start killing monsters with Massacre until you reach level 5. Then transmute the Median Statue in the Cube and prepare yourself for doing Level Challenge 0. You'll need to find a place with no obstacles around you so that traps won't spawn in a twisted manner. Go to Charsi and repair your scythe (26 durability goes to 0 very fast if you use Massacre all the time). Summon Volrath and start killing traps. When you clear all traps, make sure to dodge the rotating beam to avoid being instakilled. Scythe is a polearm type weapon so you can keep safe distance between you and Volrath. Comment: melee necromancer is not the fastest Volrath farmer because Massacre will break your weapon quite fast, so the type of reanimates on the charm doesn't really matter early-game. I got +10 attributes charm with Dominator reanimate (tanky mob with Time Strike attack). Among useful reanimates there are Gold/Bronze/Silver Titans, Undead Vultures, Oasis Guards, Moon/Pit Knights. When you get an access to Parasite and Dethlord morph things will go easier. With a proper weapon, regular monsters will drop like flies so you can experiment with stats and skills if you want. When you get to Lut Gholein, go to the Sewers and kill Radament. Beware the fiery mines dropped by Pests as they will quickly kill you if you step on them too often. After killing Radament go outside the town and start killing Grubbers for gold which will be needed for making honorific items. Be sure to have at least one honorific items with +resists modifier till the end of Act 2. When you reach Kurast City watch out for Slimers and Gloopers which will cast Miasma to poison and slow you down. Kill other monsters so Parasite projectiles will finish those dangerous mobs behind your back. When you get to Mephisto's Lair, make sure to farm him for Arcane Crystals that you will need in order to obtain some TU gear later. After you reach level 50, go back to Act 2 and complete the Level Challenge 1. You'll need some dedicated gear and fast fingers to complete this challenge. There's nothing special in the further gameplay until you reach level 80. Kill everything either with Parasite or Whirlpool (use Massacre if you have chosen procmancer's way. Upon reaching level 80, go and complete Ennead Challenge (WDM build suits better for this purpose). Terror difficulty brings some variety in the gameplay. You'll need to be more careful while attacking a pack of monsters, especially in such areas as Act 2 Sewers. Be sure to have maximum amount of life leech from Famine and Mystic Orbs by that time. The most dangerous monsters at this stage are Alpha Centaurs who greatly debuff you with Colosseum (-50% Damage Reduction). Thus, you should step out of a fiery circle before other monsters hit you. When you reach level 90, you may want to equip two pieces of honorific gear with resists instead of one before you start doing Level Challenge 2. After LC2, we don't have any challenges with level requirements anymore so you can start doing minigames and farming Act Bosses for Dogmas in order to make Signets of Skills. When you reach Act 5, be prepared for facing the most dangerous regular monsters on this difficulty. Unseelie Ladies, buffed with Burning Veil (don't mess their wall with yours) and Ecstatic Frenzy are capable to kill you in a few hits, so you must proceed with caution. Razor Fur Titans with their thorn aura have to be left alone. On level 120 we will do the Black Road Challenge. After completing BRC I suggest you to stay in Terror in order to farm some set pieces. The best areas for that purpose are Worldstone Keep/Antechamber/Throne of Destruction. Finally, before wiping Terror map, be sure to farm Arcane Crystals in Cathedral/Worldstone Keep/Tran Athulua which will be needed in big quantities for jewelcrafting on Destruction difficulty. Comment: Don't forget to disenchant each set item that doesn't belong to Rathma's set for eating Signets of Learning.
. Level 28 Punisher proc means that 3 total punishers will be unleashed in 50% times when you kill a single enemy. Rune of Ice is a trap that activates itself under enemy's feet. When touched by a mob, it freezes him and adjacent enemies for 7 seconds, which is quite a long time. Attack rating bonus is enough to forget about putting points into dexterity for some time. TU Raptor Scythe (Cane of Juris Khan) - nice option for both str-WDM build and a procmancer. Venomous Spirit deals huge poison damage on impact. The damage is somehow low, but every other attribute on this weapon is nice. TU Bonesplitter (Talon's Reach) - I'm not a fun of this weapon as it doesn't have cold spell damage attribute but if you happen to get it from a Gift Box, you can use it with str-WDM build. Huge strength requirements can cause trouble for energy-based procmancer, so it's not the best choice for him. 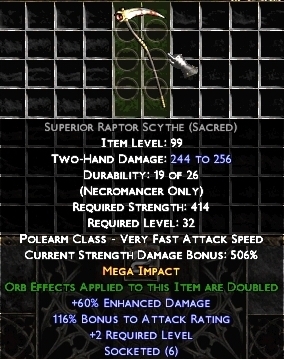 Endor RW (Jah in a necromancer scythe) - unlike the weapon above, this one suits procmancer better because Massacre can show its full potential. Eating an apple with Pagan Heart prebuffed will increase our spell damage. Chthon RW (Sur in a necromancer scythe) - both procs are very useful when it comes to clearing big areas of monsters. I'm not a fan of this weapon, because I don't like perpetual screeenshaking when playing, but still this is a nice option that is viable even in midgame. Just be sure to roll a scythe with at least 50% basic enchanted damage before you create this RW. TU Spirit Edge (Compass of Souls) - great option for a dexterity-based WDM build. Huge flat elemental damage and Whirlpool oskill make this dagger a viable choice for offensive playing. Misery RW (Mal in a necromancer scythe) - a dagger for defensive playing. Extra %slow target, life on striking (LoS) and passive poison damage are great. TU Demon Head (Hellspeak) - the best shield option. Low requirements, nice procs and extra fire pierce are just amazing. TU Kite Shield (Banner of Duncraig) - if you're planning to use Whirlpool as your main skill, this shield is not for you, because you'll benefit a little from those procs. However using Massacre change the situation dramatically. TU Splint Mail (Jitan's Kamon) - every modifier on this armor is superb. See if you can get one from a Gift Box! as your primary weapon. Unholy Armor can occasionally be a life-saver. TU Tiara (Auriel's Halo) - doesn't have strength requirements. Handy for warrior that uses dagger+shield option. 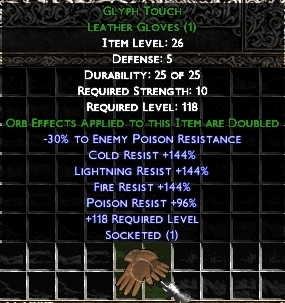 Honorific leather gloves MO'd with +all resists and flat resists orbs. TU Heavy Belt (Deadfall) - impressive proc that slows enemies down, strength attribute bonus. There's simply no other belt option that can outclass Deadfall early game. Honorific Boots - I would go for this variant if you have some extra gold in your stash. Unlike gloves, you can experiment with MO's here though extra pierce never hurts. TU Greaves (Wake of Destruction) - if you want to play a procmancer from the beginning of the game. because of awesome Celerity proc and a lot of space to put Mystic Orbs. ring also a good option. Rare one with good stats. If you find Angel Heart or Felblood you can use them as well. Perfect Ambers, Onyxes, Turquoises and Bloodstones into armor, perfect Diamonds into a Shield if you wear one. 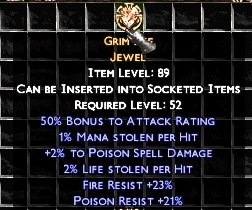 Rare jewels with flat resists are nice option too. Stats which have to be present on a jewel (from major priority to minor priority): %2 LL, 45+ %AR, fire+poison resits, cold/lightning resists, flat life. If playing a procmancer you'll need to craft jewels using Zod rune instead of Ber. In that case, desired stats will be: %6 poison spell damage, resists, flat life. When you get nice crafted jewels make sure you have at least %70 total LL coming from gear and Famine. Go and complete Butcher, Creature of Flame, Binding of Baal uberquests. Be sure to disenchant useless items for making more Signets of Learning. When you get most endgame runes (from Vith to On) you can make some powerful runewords to increase your offensive and defensive stats. Your next goal will be crafting a rare amulet with Doom proc and TTAD modifier if you're playing a str/dex based WDM build. If you're a procmancer, try to get Mythal proc. Before you go for Baal, you can try doing Azmodan, Island of the Sunless Sea, Legacy of Blood, Khalimgrad and Assault on Mount Arreat uberquests. Just keep trying intil you succeed. Also you can finally gather all Monster Tokens and comlete all minigames except Mirror Mirror (if you wan't lucky enough to finish it on Terror difficulty). When you get to the Worldstone Keep and later, to the Throne of Destruction, proceed with extreme caution. Even if you have cleared all levels behind you will both eyes closed, I'd still suggest you to make Town Portals often to avoid unexpected deaths from dangerous elite mobs. Use Angel of Death in a defensive way, leaping back to clear area, rather than leaping into unexplored territory. After you reach Baal's throne room, be very careful when fighting mobs there. When you are inside the room, you get a debuff that reduces your defense and maximum resistsances, so when Baal starts summoning his minions, try to lure them into non-debuffed area and kill them one by one. Infernal Contraption is immune to fire and cold damage and also uses a Deathstrike attack which 1-shots you. I do recommend you to clear monsters as fas as you can before you get surrounded. Baal himself requires dedicated gear. Make sure you to create honorific gear with -199 total fire pierce and get rid of all reanimates using R.I.P. recipe on any dedicated piece of gear you're using against Baal. If playing untwinked your only weapon option will be Inti RW. After you defeat Baal I'd suggest getting full Rathma set gear either by farming regular areas on Destruction difficulty such as Tristram or Cathedral or by trading it if you play on Realm. Also you can easily do Judgement Day uberquest and JDay Upgrade at the same time. The bonuses you get from the charm are truly amazing at this stage. Your next uberquest choice will probably be Lord Aldric Jitan and Rathma Square which can be the first tricky boss encounters for you even with strong gear. Cathedral of Vanity is even tougher especially if you're doing this uberquest for the forst time, so I'm gonna warn you: beating Inarius can be somehow tedious! Also, you should try doing Tran Athulua in order to obtain a nice charm. If you're lucky, you may even get a trophy before a really good charm drops. Finally the mid game ends after you complete the most boring thing for untwinked character ever: eating at least 200 Signets of Learning. Go and farm Destruction Nihlathak (Single Player) or Terror Griswold for Special Box (Multiplayer) to get signets. In the meantime you can go to Kurast 3000 B.A. uberlevel and get the charm. If you're a newbie in MXL I'd suggest you to reroll the map until you appear on the top right corner of the map after you enter this uberlevel. Comment: without any doubts, this is the best choice for midgame. is a very powerful weapon on its own even if it's the only Rathma's set piece you have. is quite hard to find, so I suggest you to trade for it if you have such a possibility. Both Crucify and Guard Tower procs are awesome at finishing monsters who happen to survive after being hit by Parasite projectiles. SU Bonesplitter (Wing of the Dragon God) - it will be nice if you find this item in regular Destruction area. Velocity bonus, slow, Stormlord passive and flat Damage Reduction together with high outcoming weapon damage will ease your job in clearing midgame uberlevels. Inti RW (Kra in a necromancer scythe) - crucial item It will be your only weapon against Bartuc in Legacy of Blood uberquest, because you'll need tanky minions to successfully complete it. Also, it can be your weapon of choice against Destruction Baal. Way of the Phoenix passive gives us huge flat fire damage which will help you will use against Baal. - 10+% slow target (if you have hard points in Talon's Hold). Comment: use Creepy shrines. Creepy/Weird shrines for blessing. If you badly need to find a set/SU weapon, use Spiritual Shrines for crafting/blessing until you get 200+%Magic Find modifier. 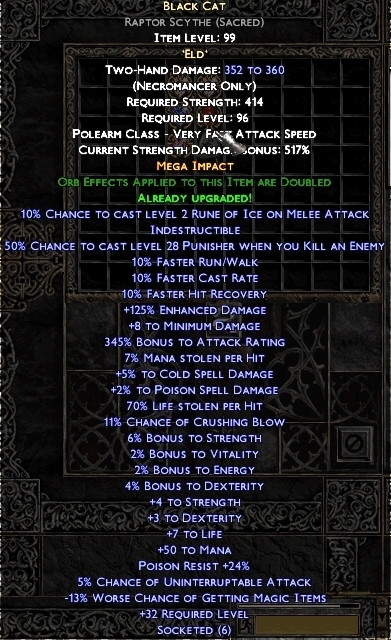 - Elemental proc (if you managed to roll an item with all of the above stats except the proc). Comment: use Fascinating/Ornate shrines for fire/lightning elemental respectively. Same for blessing. SU Spirit Edge (Mente Scura) - probably, the only decent choice for midgame if you're playing dexterity-based WDM build. If you're lucky, you will find one among Nihlathak's drops. 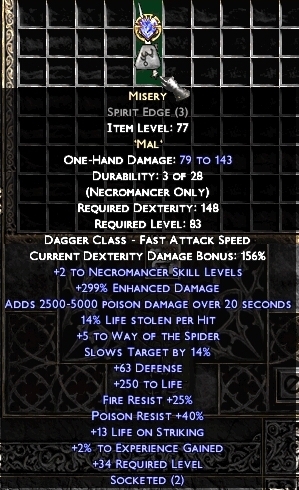 Evry stat on this dagger is wonderful. 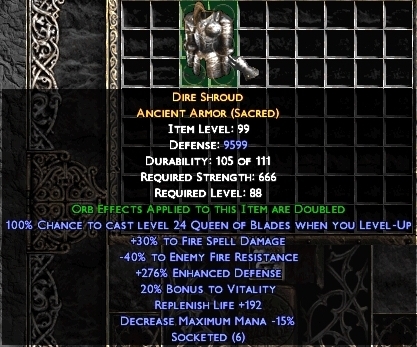 SU Demon Head (Sinwar) - good shield for midgame. Nothing much to say about this, except that we ITD doesn't really make much difference since you're already supposed to have high %AR with tons of dexterity. SU Bone Shield (Shadowhymn) - flat damage bonus is nice, as well as max.resists bonus. Decent option for midgame. Erawan RW (Nih in armor) - a cheap armor that has nice bonuses. Not very impressive after all but if you're very poor, you can use this until you find better gear. SU Ring Mail (Hratli's Craft) - if you managed to find this midgame, use it as farming gear in order to get missing Rathma's set pieces and/or some other staff. Free Crafting Points bonus is great for start making Magical Elixirs before you finish Bremmtown quest. Crafted armor for a procmancer - if you have crafted a weapon with Mind Flay or Cataclysm proc, you can craft a nice armor for yourself. Be careful not to get in total more than -15% Decrease Maximum Mana if you have both crafted weapon and armor. - 20+% bonus to strength. SU Skull Cap (Thinking Cap) - decent and cheap choice for a procmancer. Be sure to socket a jewel with Undestructible modifier into this helm. Keep your T1 honorific gloves. You'll need a lot of resists on Destruction difficulty both for regular game and basic uberquests until you get Six Angel Bag, Azmodan's Heart and Crystalline Flame Medallion. Cinadide's Bender (Paladin Holy Melee set) - great option for midgame, especially for its %MF value. Can be found on late Terror/early Destruction in regular game so, after all, this is a nice item to equip. If you're poor, stay with T6 heavy Belt. Its stats are still awesome for midgame so it's worth keeping. SU Belt (Ashaera's Armor) - decent belt for a procmancer since it gives a considerable boost to our spell damage. Cheap enough so good luck finding/trading one as early as possbile. Frost (Amazon Bow set) - again, %MF is always nice to have if you hope to find better items. Dexterity bonus is also good if you lack %Attack Rating. 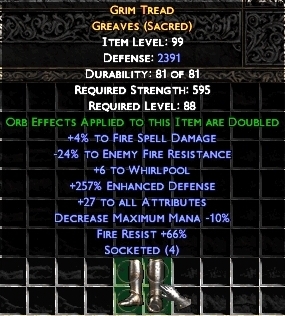 Crafted sacred greaves/light plated boots with a Whirlpool oskill. Keep your Empyrean Bands/keep rare rings with +spell damage and elemental pierce if you're a procmancer. If you're WDM build, craft a rare amulet with 3-5 to all skills, 5% Ctc lvl 44 Doom when you Kill an Enemy and Target Takes Additional Damage of X modifiers. 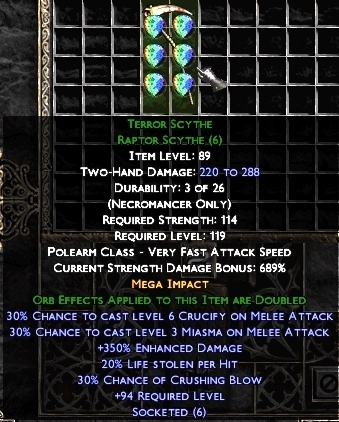 If you're a procmancer, get an amulet with 2% Ctc lvl 1 Mythal on Melee Attack or 5% Ctc lvl 27 Lava Pit on Melee Attack modifier. Comment: if you're using D2Clicker tool, I suggest to craft using Dragon's Eggs method. If not, use Oils of Renewal. Crafted jewels (see mid game gameplay part of the guide for more details). SU Wand (Vizharan) - crucial item Try to get it as fast as possbile. Both Tainted Blood and Lionheart give a great boost to your TCD. Though we already have huge LL for survivability, having decent amount of defence is needed in such uberquests as Bremmtown, so getting Vizharan will be your primairy task if you want to use melee necromancer as the main farmer of SU's/sets/runes. , your necromancer should already be able to farm Tran Athulua and Fauztinville without problems. Otherwise, I'd suggest you to get some more charms before you can go farm for the endgame gear. Your next target will be two basic heroic bosses (Bull Prince Rodeo and Quov Tsin) just for getting a charm. Later we will come back to BPR in order to farm Fool's Gold with a good elite reanimate. When you finish with both bosses, you can try to make some Unformed Land (Act 3 Sewers) runs. You must proceed slowly, carefully cleaning small areas of monsters. All of the monsters in the first level will always pierce your resists no matter how much you stack for your defence, so don't bother socketing your gear with perfect gems. When you find an entrance to the second level, go downstairs to kill Terul. Thanks to our big defence we can survive his attacks for quite a long time without needing to drink potions much. Sadly, we're not capable to kill him in a few shots, so the fight will take some time, especially if you don't have Path of Flames oskill. Your goal will be getting a bunch of SU's and a few Trader's Chests (this will take several runs). Endgame we don't actually need any Elemental Runes, but you can continue running through the first level to get all components needed to create a single Kabraxis' Stone (Xis rune). In the meantime keep eating more Signets of Learning. When you reroll a good Trader's Chest you are ready to do four hard uberquests. These are Ghosts of Old Bremmtown, Kingdom of Shadow (Ureh), Duncraig and Vizjun. Back in time they were considered as ultimate uberlevels but now they are just another step ahead before you reach the very end of the game. It doesn't matter which of the above will be your first one except for Vizjun which can only be completed after you get a Purify oskill in Duncraig. I would've completed them in the order I have written. Don't worry if you cannot complete any of them at the first try: after all, they are considered to be very hard uberlevels Be sure to learn the location of all bosses in Duncraig, and bosses in Vizjun and Ureh. You'll need to look through the LFAQ section in the documentaion to find corresponding uberlevel maps. Considering the walkthrough, I'd say that Vizjun is harder to do with Rathma's set than with endgame gear but if you equip a Ring of Disengagement to get Celerity proc, you can rush to the boss with no problem. After you complete all uberquests mentioned above, you're supposed to have enough items in your stash/mules to trade some powerful SU's. The next charm you might want to get is Book of Lies. In order to kill Belial and farm him for 450+ life (450+ mana if you're playing a procmancer), you'll need some endgame gear. By that point you should be able to safely farm Fauztinville and Tran Athulua and, after some trying, Duncraig. When you get Belial's charm you can proceed forward to the harder uberquests such as The Truine and Yshari Sanctum. The first uberlevel can be easily cleared with full Rathma's set. You'll need some cycles to help you in ultimate ubers. Yshari Sanctum is another tedious uberquest. All set parts can be obtained using Rathma's set. As for Valthek, use the skills given from Vizjerei set. The final goal is to complete the hardest uberquests. By that time you should have already eaten 500 Signets of Learning and gathered lots of endgame stuff. If not, spend some more time farming Duncraig/Fauztinville/Unformed Land. Note that pure melee necro is not a build who can complete everything without respec, so in some areas like Uldyssian uberquest respec is crucial. Edited by Stealthmaster 2 years. Comment: Full Rathma's set can be very effective as an end-game gear. Tzeentch RW (Sha'ad in a necromancer scythe) - my weapon of choice for endgame which best be used with Parasite skill. Level 14 Punisher on striking means that 2 total punishers will emerge from your body each time Parasite missile hits somebody. Considering the fact it can hit up to 44 times if you put 20 hard points into that skill, our necromancer will unleash a huge amount of punishers per second. Singularity proc is great for finishing monsters with low health left behind punisher range. Be sure to prepare a basic weapon with at least 50% ED and if possible, bonus to %AR in case if you don't have source of Ignore Target's Defence modifier on your gear. 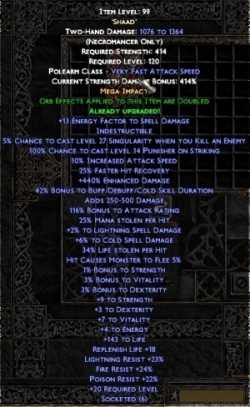 Having Double Orb modifier in addition to the stats mentioned above will be perfect. This RW must be socketed with a jewel that has Undestructible modifier on it. I MO'd it with LL orbs because %ED orbs doesn't make much difference since punisher proc deals spell damage. SSU Raptor Scythe (Seven Heads of Tathamet) - crucial item Flamefront proc makes this weapon one of the best items for a procmancer. Can reach full potential if used with Massacre. Using it against creatures with Heroic Shield can be quite eefective if you have at least -150 fire resists and lots of spell damage. SSSU Raptor Scythe (Prowler's Slash) - by sacrificing WDM you get flat elemental damage which, when used together with Kraken Stance, can make wonders but only if you can stack additional (up to -100%) tri-elemental pierce. Otherwise, I don't recommend using this as your main weapon, except for having fun. Leviathan RW (Taha in a necromancer scythe) - if you don't have any other decent weapon but have a Taha lying around, this RW can be your farming weapon. Just note that without any procs the gameplay may become even more boring, but all other stats are fine here. With sMaxed Talon's Hold total amount of %slow target makes this a good weapon for defensive playing which can be useful in Duncraig uberlevel, especially if you're not familar with its map. Chthon RW -Realm-only upgraded version- (Sur+Xis in a necromancer scythe) - buffed version for endgame. Procs now get increased level as well as increased chance of being cast. Visit this page to view stats: http://forum.median-xl.com/viewtopic.php?f=32&t=413. 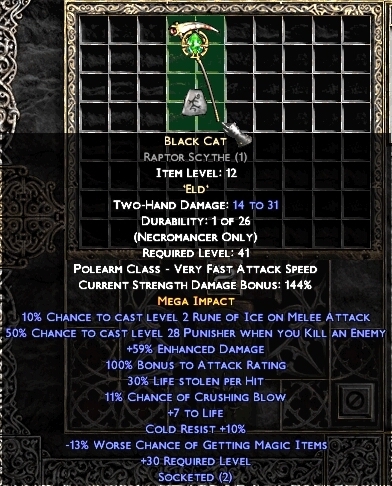 Black Cat RW -Realm-only upgraded version- (Eld+Xis in a necromancer scythe) - buffed version for endgame. Level 57 Punisher proc means that 6 total punishers will be unleashed in 60% times when you kill a single enemy, dealing incrediable amount of poison damage on impact. Level 62 Rune of Ice proc freezes enemies for the same 7 seconds as level 2 Rune of Ice proc, but you get bigger %AR and %Crushing Blow bonus than on non-upgraded version. Mkodos RW (Sha'ad in a necromancer dagger) - one of the best options for a dagger procmancer. Stack at least -80% enemy poison resists to increase damage. If you are using Whirlpool oskill you can even forget about life leech and craft jewels with 5-6% posion spell damage instead. SSU Hexblade (Rathma's Athame) - honestly, I'm not a fan of this dagger. Procs are not that impressive as it they seem (Ice Lance will lag a lot even if you use Massacre), but if you have anything better, use this. Be sure to invest all points into dexterity for gaining more damage. SSSU Kriss (Black Razor) - quite a nice weapon for a full-dexterity WDM build. Damage is not impressive, but the proc will do all the job if using with Parasite. Best option would be either SU Demon Head (Sinwar) or SU Bone Shield (Shadowhymn). SU Gothic Plate (Scales of the Serpent) - my favourite option for endgame. Effective for both WDM build and a procmancer (though it will take some time to craft jewels with both -str reqs and good spell damage), this armor is a quite cheap and common variant. Natasha's Legacy RW (6x Xis runes into an armor) - very expensive option for endgame and if I were you, I wouldn't bother farming/bying its components for making this armor. See if you can trade for an already created RW with good stats. Aim for at least -20% pierce and 15+ %DR. 2-3% max.resists bonus would be nice though non-mandatory. SSSU Plate Mail (Wolverine Skin) - great %MF bonus and Crucify proc are what make this weapon one of best variants if you're planning to farm gear for another chacraters. SU Full Plate Mail (Robe of Steel) - excellent armor for a procmancer. Great bonuses both to spell damage and defence, flat strength bonus - an awesome alternative to any crafted armor. SSU Light Plate (Hellbourne Disciple) - another variant for a procmancer. Be sure to use it with an appropriate crafted weapon that has as much lightning spell damage and energy factor as possible.
. Dedicated item, not as useful if you're not using the mentioned RW. SSSU Leather Armor (Warrior's Robe) - a special armor which is great to use against ultimate uberbosses thanks to great %DR and flat DR bonuses and great boost to %AR when you need to get 95% chance to hit the boss. SSU Great Helm (Metalhead) - the cheapest source of ITD modifier for a strength-based WDM build. You also get decent procs to use with Masssacre, good TCD bonus and tanky reanimates. SSU Circlet (Eyes of Septumos) - see if you can get one with at least 50% spell damage of an element you're using with a procmancer (most likely, fire/lightning). Also, it's a decent variant to have with a necromancer that uses Mkodos RW. SSU Bone Helm (The Veil of Magic) - Spirit of Vengeance is immortal and her aura increases fire spell damage. Flat elemental damage are also good. Decent item, if you managed to get it, but there are better ones. SSSU Leather Gloves (Demonic Touch) - one of the best endgame choice for a strength-based WDM build and a perfect addition to full Rathma's set. Cataclysm proc works great with Parasite and extra %DR never hurts. , these gloves will be a nice choice if you can farm Unformed Land for its componentns. Also it will solve all problems with fire resists. Nero RW (Auhe in a belt) - my favourite belt for endgame. Very versatile for any build (use a plated belt if you're playing a str-based build, otherwise use one with lesser requirements). Ahriman (Ghal in a belt) - nice option for dexterity-based build (there's only one jewel with -str requirements to socket, thus use a belt with lesser requirements). Resists are very nice as they allow you to use crafted jewels on other gear without paying much attention to resists modifier. Flat elemental damage is awesome as well. SSU Plated Belt (Lilith's Temptation) - great belt to use for farming another gear as it has huge %MF. , this belt is a great option for a procmancer that uses fire spell damage, though not always cheaper. Nightmare is a curse that slows monsters down and prevent their healing. Comment: There's no really good boots among Sacred Uniques/Runewords for a melee necromancer so I suggest either keeping crafted Whirlpool boots you were using for midgame or craft another one with better stats. 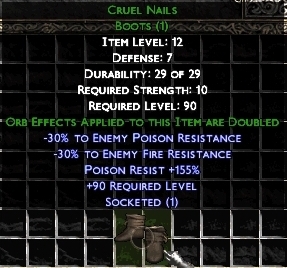 SU Chain Boots (Toesie Warmer) - cheap enough, with a great proc and some other bonuses, this item can be your final option for endgame, if you're not a fan of Whirlpool oskill. SSSU Boots (Wizard's Path) - Elemental Totem dramatically increases total spell damage you have (the more +all skills you stack, the more %SD you get). The totem itself is squishy, so if you're wearing these boots be ready to cast it often, otherwise this item doesn't worth paying much attention to it. Comment: Keeping Empyrean Bands for endgame will be a good decision. Remember that you need rare rings with good spell damage for a procmancer. Ras Algethi - quite a tricky option for a procmancer if you've chosen fire spell damage. Negative %DR is not good having with a melee build, but still, many other stats can easily compensate it.
. Note that Disintegrate oskill doesn't work with Deathlord morph. Lamen of the Archbishop - rather common item to drop. Try to get a good roll. Beads of the Snake Queen - excellent endgame option. The proc can be activated if you kill an enemy with a poison spell. Crafted jewels. Endgame you're either already have ITD modifier or good dexterity, thus high %AR. That's why won't focus on getting %AR stat on jewels anymore. Stats which have to be present on a jewel (from major priority to minor priority): %2 LL/6% SD, 15% FHR, 15% IAS, fire+poison resits, cold/lightning resists. Edited by Stealthmaster 3 years. Level Challenge 0: Run in circles to avoid instailling beam. Use Massacre to get rid of traps and Volrath when he loses immunities. Put Burning Veil on RMB and buff yourself from time to time to speed up the process. Difficulty: Easy. Farming a good reanimate is not hard at all. Just don't forget to repair your scythe after each second run. Level Challenge 1: When you enter Tran Athulua, run in cirles spamming Whirlpool if there is a pack of amazons spawned. If there's only a Pirate in there, kill him, pick up the charm and proceed further, killing enemies either by Massacre or Parasite. Life leeching is essential on this level. Make sure to attack enemies all the time, drink potions if needed. If you stop leeching life staying in front of amazons' pack, you can be hitlocked by homing arrows without a chance to perform an attack. Priestesses can be very dangerous after casting Tremor so if you see your hp falling to the minimum value, retreat, drink a potion and go back to the fight. Phalanx (wall of amazons) can also be very dangerous if you stay under arrows for more than 1 second. Difficulty: Easy-Medium. Easier to do with a WDM build than with a procmancer who need to kite often to avoid being hitlocked. Level Challenge 2: Those guardians have stupid AI and walk rather slowly. Their most dangerous attacks are Frozen Soul (big blue orb) and Elemental (few flaming figures). You can kill them one by one or separate the whole band to small packs and kill them all by using Parasite or Massacre. Whirlpool also works fine here, allowing to keep monsters in maelstroms all the time when they chase you. I suggest stacking at least 150 fire/cold resists and have overall 75% resists to survive. If you're using two pieces of honorific gear (gloves and boots) you'll feel much safer. Difficulty: Easy. If you stack enough resists, of course. Ennead Challenge: Enter Kurast, use Massacre/Parasite/Whirlpool to kill non-immune skeletons. When you see first purple monsters (with immunities), use Angel of Death to jump your way to the nearest Totem, using the same skill against it (it should die in 2 AoD hits). Clear another pack of skeletons and quickly proceed the next totem. When you get to Ennead Necromancer, remember that his curse prevents your healing from potions so either leech life from adjacent skeletons or retreat to the safe place if your health orb is almost empty. After you get your Class Charm you can use Kurast to level up (you can gain up to 10 additional levels when doing this challenge). Difficulty: Easy-Medium. If you're a procmancer, I suggest using a weapon with poison proc (like TU Raptor Scythe) because there are no monsters with poison immunity there. Look at the map if you don't know where totems are located. Trial of Greed - Go to Dry Hills to kill Grubbers for gold. Trial of Contrition - Kill warriors one by one avoiding being hit by Fortress. When you kill King Koth make sure you don't step on his corpse (Hawk Talons will be activated to finish you in a matter of seconds). Trial of Fear - When under Bloodlust buff the Butcher is capable of killing you in 1-2 hits even with maxed Emblaming. When you face the boss you're supposed to have ~30% chance to be hit by him, so it's pure luck who will strike first. You can die a lot of times here, but corpse recovery is really easy (you need to cast Deathlord before you pick up your corpse to walk faster). Even if you have Shadows, I suggest using Daystars as minions who distract the Butcher as they are stationary. The best weapon to use against Butcher is a honorific scythe. Trial of Knowledge - Proceed slowly, following the yellow path to the yellow dots (robot location), using Parasite/Whirlpool to leech life. Inti RW would be the best weapon to use because we need Fire Elementals to be our meatshields. Be sure to have at least 5-7 elementals summoned in Fauztinville all the time (keep summon skill on your RMB all the time if you're not ready to skillswitch). Avoid dying there because corpse recovery can be impossible in some situations. Difficulty: Medium-Very Hard. The last two trial are the hardest ones for an untwinked melee necromancer with Trial of Knowledge being almost impossible for a procmancer. For Fauztinville you need to deal a lot of damage in a short period of time which is easier achievable with a WDM build than with a procmancer who relies on spell damage. Witch Queen: Use Daystars to lure stationary witches, kill a stalker (minion of Countess) and cube the rune. Crowned: Summon Daystars near a witch in tamoe Highland to see if your minions have a glowing cross on them. You can go back to town to reset the witch if you weren't lucky. Mirror Mirror: Terror Baal dies very fast no matter how carefully you will attack him and his minions, so I find easier to do this challenge when fightning Baal on Destruction difficulty. Just quickly go back to town and cube the rune out of danger. Veteran Tokens: All of them can be easily killed with Parasite/Massacre/Whirlpool. Note that veteran monsters possess different immunities so you may want to change your weapon if you're having a hard time killing one. Dragon's Eggs: Note that sometimes a Dragon may spawn with 90% avoid. In this situation, use Dark Summoning to get a normal dragon. 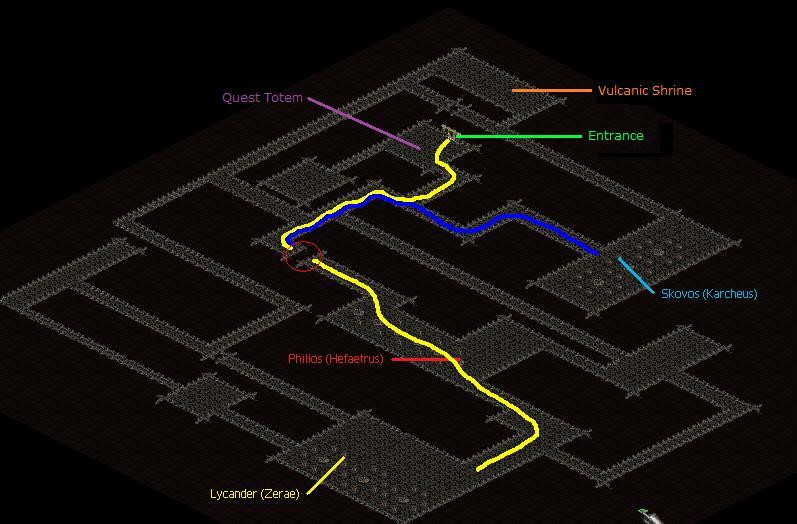 Comment: Those uberquests marked with * include a map under the spoiler. In order to get a full information, you have to read the text while looking at the map at the same time. Death Projector: Run in circles around the boss, damaging him. I suggest standing all the time at '10 o'clock position' before the death spiral starts rotating so you'll avoid being instakilled. Difficulty: Easy. Doable in midgame with any gear. Creature of Flame: There are two variants of doing this uberquest: with prebuffed Graveyard or without it. The 1st variant assumes you run in circles around the boss, while the punishers from Graveyard will damage him. The 2nd variant (which I recommend using if I were you) is get struck by a guardian until you get invulnerability aura, rush to the boss and damage him with Massacre. Difficulty: Easy. Massacre works much better than Parasite/Whirlpool here. Infernal Machine: Until the boss is dead, it's safer to use Angel of Death only. Jump your way to Unfernal Machine, damage it, jump to another corner to take a charge and finish the boss with another AoD strike. When it's dead, kill everything with Parasite/Massacre/Whirlpool. The most dangerous enemies inside are Alpha Centaurs and Unseelie Dames. When you get debuffed, use Angel of Death to escape to the farthest corner of the level. Difficulty: Easy-Medium. Sometimes massive broadside of quills from Trap Rats mixed with different monster attacks can cause lagging, so at the end you may find yourself dead. Be sure to use Angel of Death correctly, not staying for too long on the ground before the boss is dead. Rathma Square: Enter the level, go to the upper corner, start killing Gore Crawlers. When you finish the pack rush forward to the boss area. Make Primus follow you, go back to the upper corner, kill revived monsters. When Primus is left alone, start damaging him, drinking potions when he casts Bladestorm. When he is low on health he will run away from you. Your goal is to finish him as fast as possible without paying attention to revived monsters. Grab the charm and either rush to the entrance or Save+Exit if you're surrounded and have almost no hp left. Difficulty: Easy-Medium. Depending on luck and density of the level. Azmodan: Enter the level, wait for 1 second. If there are no monsters and you don't get cursed by Unseelie Dames, proceed to the right. Your goal is to lure some monsters to the lower right corner before you face the boss. When Azmodan appears in front of you, he dies rather quickly. Be careful not to jump to the big packs of monsters when they lose invulnerability shield, as they can still quickly kill you. Use the corridors to separate dangerous monsters and kill them in small packs. Difficulty: Easy-Medium. If you get surrounded after you enter the dungeon, you can either restart the game or use Angel of Death to jump your way to the boss. However, if the density is high you can die right after you land to the ground. As in Rathma Square, low density map makes the job easier. Cathedral of Vanity: Prebuff yourself with Graveyard and Burning Veil, summon shadows or Fire Elementals from Inti RW. Your goal is to lure Nuns of Vanity and Inarius to the small room near the entrance. Go back to the Underground Passage to resummon maximum amount of minions. After that go back to the dungeon and rush past monsters to the big room. If you see a death spiral activated, quickly go back to town, using TP, resummon minions and go back after 3-4 seconds. You can either use Angel of Death or simply run to the Crystal Ball. Graveyard will also damage the ball, so it dies rather quickly. After that, finish all monsters with Parasite/Massacre/Whirlpool. Difficulty: Medium. The only tricky situation you can encounter is Teleport modifier on Crystal Ball when it gets away of you. If there's such a modifier, I suggest you restart the game unless you have fast reflexes and can quickly finish the ball after its teleportationto a random place. Aslo, be sure to stack enough lightning resists to avoid being killed by High Clerics. Toraja: Put Summon Edyrem skill on your RMB. Your goal is to have edyrems summoned all the time as they not only dispel immunity shield from enemies but also take a major part of arrows from Celebrants. If you're not planning to get Auhe or Shaad runes, your only target is Lilith. Go to the upper left corner of the level, killing Celebrants one by one. In order to dispel immunities, an Edyrem must stay alive for 2-3 seconds staying on top of a monster and performing an attack. When Lilith appears, spam Edyrems on her head. She will start summonng Morlus so your goal is do break Lilith's immunities and concentrate on killing Morlus by Parasite so its missile can damage her behind your back. When she dies, cube your charm and leave the level. Difficulty: Medium-Hard (Annoying). If you have full Rathma's set, you won't have problems with killing enemies and surviving in Toraja. Unfortunately procmancer is having hard times here, because life leech is essential and using Parasite instead of Massacre will bring more benefits. Lilith is killable but if you want to farm Great Runes, you better stick with a WDM melee necro. Vizjun*: Put Angel of Death skill on your RMB. Also you have to bind Purify oskill on a hotkey so you can quickly switch to it when you're standing next to the boss. Equip a Ring of Disengagement for making things easier. 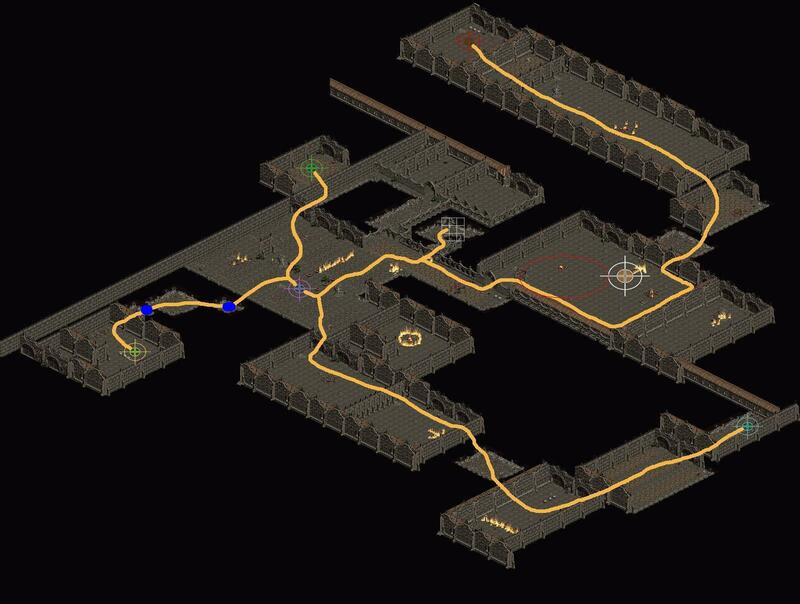 Follow the yellow path, killing robots within the yellow spots. Use Angel of Death to leap forward in order to avoid mines and MIRVs when you hear 'Nuclear Launch detected' sound. 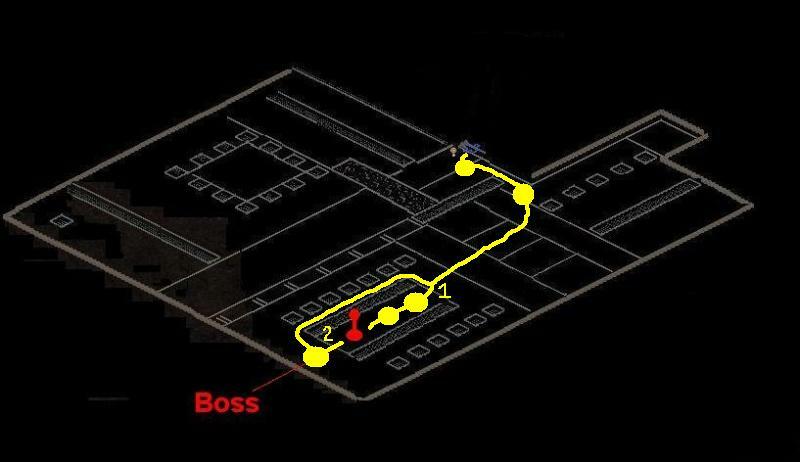 Choose 1st or 2nd path to get to the boss. When you get to MCS, purify him and grab the charm. Difficulty: Easy-Hard. Unfortunately procmancer is having hard times here, because life leech is essential and using Parasite/Whirlpool will grant you much more survivability as if you were using Massacre. Comment: Make sure to farm at least two trophies because stats on it are really nice and because you'll most likely cube it with a Witch charm. for Open Wounds and a weapon which has at least 150% AR bonus on it. 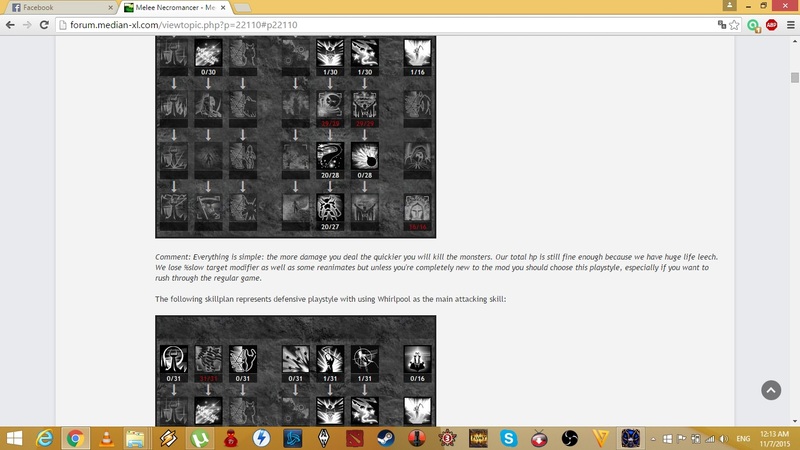 Secondly, respec your stats (half into dexterity, half into vitality) and be sure to have Summon Shadows skill. When you enter World Nexus, go all way to the right. 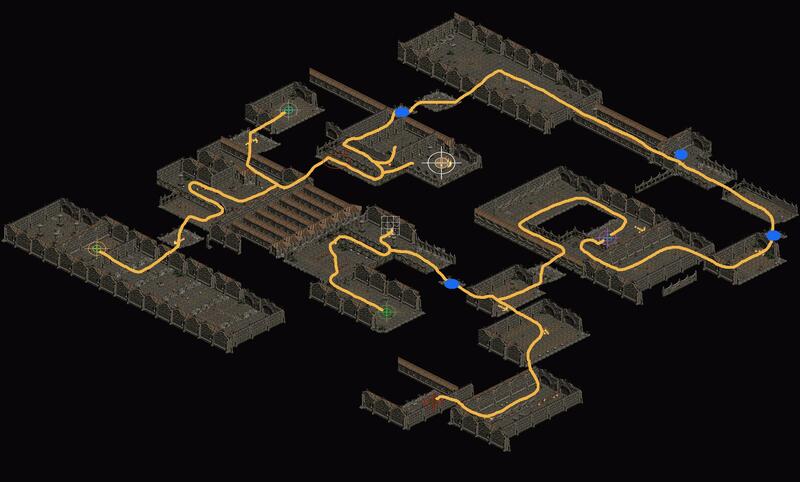 After you appear in the second level, go all way down. When you come to the third level, you have to find a crossroad with no stationary witches on it. Then go the center of the level, summon maximum amount of Shadows (they are magic immune) and distract the guardian with Deckard Cain voice. When the Witch appears she will pounce on your minions and keep attacking them while you will purify her from behind. Her nova deals massive magic damage but if you're staying right behind Shadow's backs it will bypass you. Difficulty: Hard. The best way to apply Open Wounds on the boss is Disco Inferno oskill. If you don't have it, use Wyrd (cube 15 Wyrd MO's with a Ripstar ring). The Butcher: He is still capable to kill you in 1 hit, so you have to move and kite fast. As for BRC, summon Daystars until the Pentagram appears, lure him into it and kill. Difficulty: Easy. Doable even with a honorific scythe/dagger. The Binding of Baal: Use the same strategy as for LC2, except that you need at least 250 fire/cold resists which are easily obtained by socketing perfect gems. Difficulty: Easy. Doable with early game gear. Akarat: You have to separate at least 2/3 of Akarat's minions. When there are only 3-4 zakarumites left, lure a few of them closer to the boss and kill them. After that start damaging Akarat. Occasionally he casts Inner Fire and restores to full health. In this situation you can either finish the last of his minions and start damaging him again or summon another Akarat and repeat the process. Use Massacre/Whirlpool/Parasite for killing. Difficulty: Easy. Doable with early game gear. Hammertime can kill you in a matter of seconds so keep an eye on your health orb. Drink potions if needed. Legacy of Blood: We need summons here. No skill from our summoning tree is nearly as good as Fire Elementals from Inti RW. When you equip this weapon, presummon Fire Elementals, summon Bartuc and let the golems hit your minions. As soon as you see blue fire on the ground, start damaging the boss. Use Massacre or Parasite to finish him before he gets his immunity back. You can also leave him with 50% hp and flee to the surface to resummon your minions and finish Bartuc when you come back to the tiny room. Make sure to farm the trophy. Difficulty: Easy-Medium. Occasionally you may die in 1 second if you step on Immolation Bomb chest which is barely seen in this room. If you got killed after Bartuc's death, you can get back to recover your corpse; if Bartuc was alive, restart the game. Lord Aldric Jitan: First of all, kill Lionskull the Bent and his minions, go to the Halls of Anguish and create a Town Portal there. Go back to the arena and summon the boss near the entrance to the Halls. Quickly run back to the red portal and start luring the guards one by one. Kill them with Parasite/Massacre/Whirlpool. Avoid getting hit by Singularity and Guard Towers. After several kills the boss will come out. In most cases he will have immunity shield so your goal is to go back to town using the Red Portal and get to Halls of Anguish through the Blue Town Portal. Finish all his minions and approach Lord Aldric Jitan. He will cast Fortress which can heavily damage you so be sure to step back for a few seconds. When you catch him in melee range start damaging him. In 9 of 10 times when LAJ loses 2/3 of hp he casts Lifeblood (self-healing spell which is activated for a long time). So you can either continue damaging the boss till Lifeblood stops and get a lucky chance to kill him before he casts the spell again; or you can go back to town and quickly roll a rare amulet with 1% Ctc lvl 8 Nightmare when you Take Damage modifier. Proc activating may take some time but once Nightmare is on, the boss dies very fast. 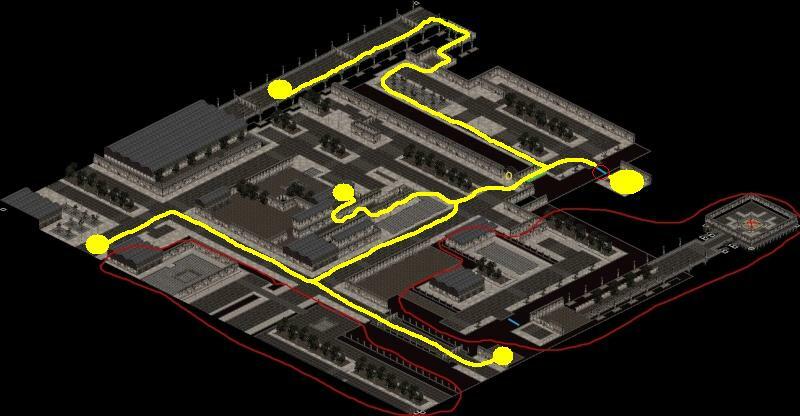 Comment: Be sure you haven't activated the waypoint in Halls of Pain. In the opposite case you'll lose the Red Portal which will harden the quest! Difficulty: Medium-Hard. You need good defence and high hp to sustain damage from Fortress so make sure you have at least 15 hard points in Embalming and maxed Death Ward. Judgement Day*: Respec to Crossbow setup (1 point into Voodoo Shot, Death's Fury Totem, Sacrifices and Rathma's Chosen). Cast Sacrifices in a yellow dot, summon a totem and buff him with Rathma's Chosen. After that make a Town Portal at the blue dot and use Dark Summoning. Then quickly step back to the red cross area and start spamming Voodoo Shot. Don't forget buffing your totem with RC from time to time. When an avatar appears Voodoo Shot will melt him in a few seconds. After that distract Dark Nephalems away and grab the charm. For an upgrade you will be using the same strategy except that the charm has to be already put to the cube. Just keep spamming Voodoo Shot in a hope to kill the other avatar while you have swirlies. Go back to town and cube the charm. Difficulty: Easy-Very Hard. Actually you can do this uberquest without respecing to Crossbow, but it requires fast reflexes and a lot of luck when an avatar appears (hoping that you will be standing far from Beacon nuclear blast). The boss no longer has poison immunity so a few hits from Angel of Death will kill him. Also it requires a town portal to be created in a Jail level 3 in case you need to recover your corpse. I strongly recommend using Crossbow respec here. Inarius' Revenge: Use the same strategy as for Tal Rasha and King Koth. Summon them after Inarius and High Clerics are dead and kill them one by one. Keep your eyes open to not get instakilled by a Deathstrike. Difficulty: Easy. You need to move all the time to avoid being hit by Overlords. Whirlpool works best here but you can use Massacre or Parasite as well. Brother Laz: You will need some endgame gear to reach certain stats as: 50% DR, 50% slow target (max for bosses), 150 LoSiM, FHR and FBR breakpoints as well as at least 12k life. The main problem in this uber is keep moving in a right way so the boss won't fill a lot of space with totems. When you practise this for a couple of times and able to move slowly enough you can finally do the actual killing. This requires hitting him to apply slow and OW and then, purifying. Brother Laz has certain chance to %avoid damage so be prepared to repeat your attacks and purify him some more. Dodge his Singularity and Deathstrike and keep attacking him to apply OW again and again. (if you don't have Uldy sword for Purify yet). My final stats are: 36% Avoid, 48% DR, 150 flat DR, 64% Slow Target, 188 Life on Striking in Melee, 14k life, 600k defence, 15% chance to block. Half points into vitality, half in dexterity. Max points into Talon's Hold, Embalming, Deathlord and Death Ward. on-switch to clear groupies and totems. Kurast 3000 B.A. *: In order to get the charm you'll probably need to rerun a level a few times. Although you can find some set pieces there, in most times Kurast is not worth farming since sacred items don't have a significant chance to drop there. 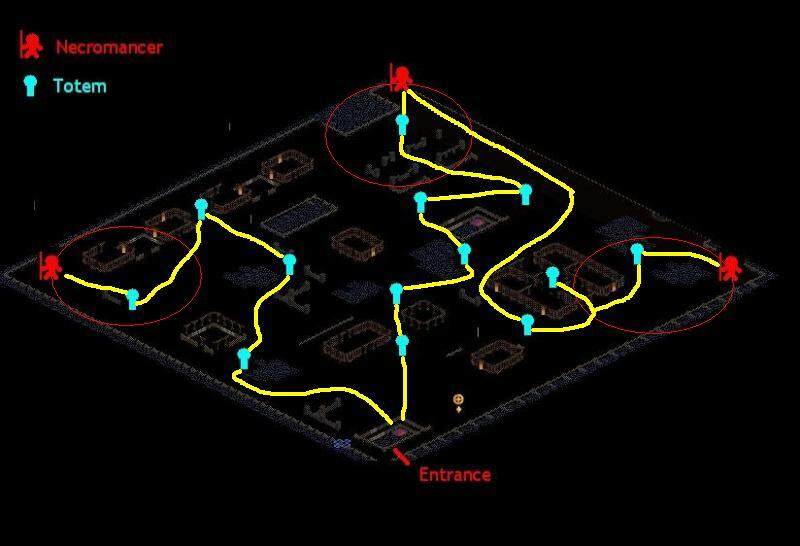 Use the same strategy as for Ennead Challenge: you shall follow the yellow path, killing skeletons on your way. Red circle shows an approximate range of Ennead Necromancers when they cast Nightmare and Miasma on you. Difficulty: Easy-Medium. If you get surrounded while being under Nightmare curse, use Angel of Death to leap away from danger. Then either go to town where the healer will dispel Nightmare or wait till it wears off. Island of the Sunless Sea*: There are two bosses here. Malic casts homing Warlock bolts that instakill you. Try to distract his attention by summoning minions on top of him. If there are too many bolts dlying to your direction you can step back and wait behind the red line until all bolts vanish. Malic dies rather quickly but still you have to take extreme caution when approaching him. When you grab the charm, go to the right direction, following the path which leads to Lucon. Red circle shows an approximate range of his aura of invulnerability which makes enemies immune to all damage when Lucion is standing still on his spawn point. 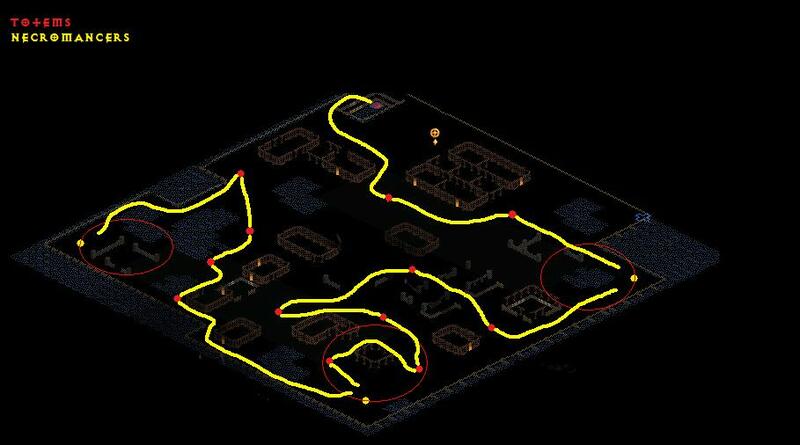 Be sure to clear all monsters in these areas using Massacre, Parasite or Whirlpool. Lucion needs several hits to be killed. 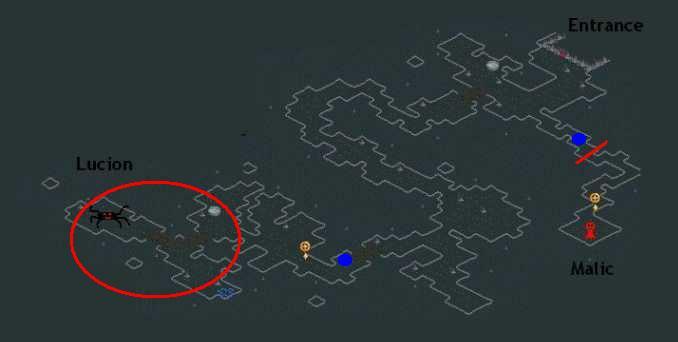 Blue dots show the spot where you can create a Town Portal in case you need to recover your body. Difficulty: Easy (Annoying). If Malic kills you in melee range it may take you several attempts to recover your corpse, but it's doable anyway. Khalimgrad: This uber is the most useless in the mod so your strategy is simple: enter the uberlevel, quickly teleport to the upper room, kill adjacent zakarumites and finish the avatar. The latter has high avoidance so you have to deal heavy damage in order to kill it before you get surrounded by Lantern Archons (orange untargettable flying spheres). If the charm doesn't drop, go to the bottom right corner to kill another avatar. Occasionally you can get hit by a punisher from untargettable spires but stacking poison resists doesn't make sense because you can leech life a lot or simply drink a potion. Tran Athulua: Life Leech is essential in this level. There's not much to say about the strategy for a WDM melee necromancer here except that you have to keep your eyes open for Arrowside proc (stream of arrows to a random enemy). This 'random enemy' will be either you or your reanimates so be ready do step back if you get hit by an Arrowside. If you're using a procmancer make sure you have prebuffed yourself with Burning Veil. Also it's good to be surrounded by Shadows most of the time. They will both take Arrowside procs on themselves and give you spell damage boost that you'll need in Tran Athulua. Remember to dodge Phalanxes and drink potions if you get 'struck' by Tremor and you'll be fine. Be sure to farm the trophy and the charm with at least 14% bonus to hp/mana for WDM/procmancer. Difficulty: Easy-Medium. Don't rush into big amazon packs! Fauztinville: There's no charm on Destruction difficulty but you can use this level for farming jewelry, runes and shrines. If you're planning to farm Great Runes make sure you have either full Rathma's set or some Sacred Unique gear from Nihlathak/Tran Athulua. Inti RW can also be fine because of Fire Elementals who will serve your meatshields. Prebuff yourself with Lionheart and Tainted Blood from SU Wand and start farming. If you're a procmancer you have to remember that Neon Fiends are immune to elemental damage so I suggest to have another weapon on-switch (with poison proc, for example) which you will use against them or vice versa. Difficulty: Easy-Hard. If you have more than 100% life leech you'll rarely die in Fauztinville. If you're facing a big pack of Necrobots in melee range with no other enemies around you, you'll die very fast because life cannot be leeched from monsters with physical immunity. Fortunately, this happens rather rarely but you have to be ready for such a situation so you can lure other monsters to those pack of Necrobots to steal life from them. The Truine: Parasite is the best skill to use here. Why? Because there are some monsters we really don't want to face in melee range. These are Kraken Guards (they cast Ice Beam that deals heavy damage) and Primal Clays who can surround you and debuff with Shower of Rocks. Temple Spires can easily be killed if you rush to them and perform a swift attack. Impaler Archons won't be a trouble if you have high TCD. I suggest to open Town Portals from time to time in case you won't see a falling meteor which will kill you as soon as it appears on the screen (meteor has a big AoE, thus you cannot escape if you've already seen it). The boss (Arihan) is something different: you need to be in his range to apply -100% avoid aura on him so Primus' Messenger can damage him. The latter can cast a very dangerous spell (multiple hostile teleport + summon bats on top of you) so you have to escape from danger as fast as possible. Bats can be killed with Parasite/Massacre/Whirlpool. I strongly recommend using SSU Marrow Staff (Karybdus' Descent) on-switch so you can use Dominate instead of Dire Charm against Arihan. Difficulty: Medium-Very Hard. The boss encounter can be very frustrating, especially if you lose the charm while Arihan is on frenzymode casting Fissure. Be sure to kill every single regular enemy in Primus' area before you lure Arihan there. The Unformed Land aka Kurast Sewers: Your goal will be finding an entrance to level 2. Thus you have to switch the map on and proceed forward, slowly moving along the walls, killing small packs of elementals. All of them pierce your resists and no matter how much of them you stack you'll always take damage from their missiles. When you enter level 2, you'll find Terul as soon as you head to the center of the level. He has a huge life regeneration which can be stopped wither by applying Open Wounds (you must have 100% OW with your gear) or by activating Nighmare proc from the amulet you were using against Lord Aldric Jitan. You have to rerun him several times, collecting at least 5 Trader's Stashes and picking up Sacred Uniques. If you're playing on Realm you can try farming Elemental Runes for making 1 Xis rune in order to obtain some powerful endgame weapons. No matter how many life leech you have you have to take extreme caution avoiding big packs of elementals. Be sure to use Angel of Death properly if you need to escape when low on health. Difficulty: Medium. It might take you some time to gather all components for making a Xis rune, so cleaning the full level makes sense only if you are familiar with its stucture and have fast killspeed. Kingdom of Shadow aka Ureh: First of all, socket additional Perfect Turquoises into your gear until you get 95% poison resists and 400 flat poisonr resists. Prebuff with Lionheart and tainted Blood, put Angel of Death skill on your RMB and enter Ureh. Here you'll encounter untargettable zombies that move very fast, and Gorebellys that move very slow. There are aslo Punishments Turrets that can drop nice items when killed. You're already suppose to know the map very well so just walk you way to the narrow bridge using Angel of Death if you get surrounded. When you reach the bridge just use Angel of Death frquently in order to make your way past tight hordes of zombies who will block you very often. When you reach the dead end where Juris Khan is, use Angel of Death on him and the same skill to leap back. Juris Khan requires a few hits to drop dead. Poison from Angel of Death will damage him for a few seconds, so by the time the boss dies, make sure you leap away back to the bridge where his Death Spiral won't get you. Then go back and pick up the charm. Difficulty: Easy-Medium. You can create a Town Portal when you reach the dead end so if you die to Death Spiral you could recover your corpse by luring zombies to the different direction naked, dying the second time and picking up your main corpse safely afterwards. Ghosts of Old Bremmtown*: Your goal is to get to the Dark Star Dragon without dying or leaving the level within 3 minutes. This is achievable with midgame gear but you have to know the map well and be ready to react fast. If you're playing a WDM build get as much life leech as possible. This includes smaxing Famine and socketing all gear with crafted jewels with 2% LL on each of them. Put Summon Edyrem skill on your RMB in order to make monsters appear on top of them and start killing them all with Famine or Whirlpool. When you will be doing it for the first time, don't bother about the time. 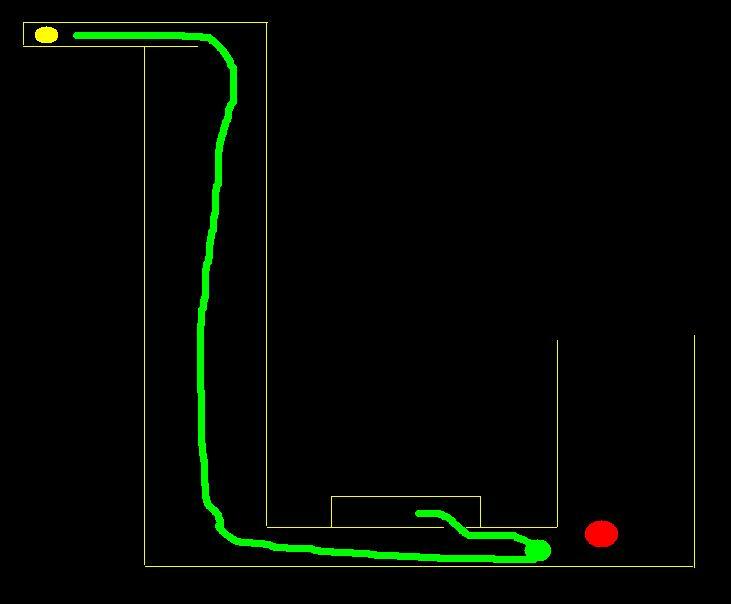 Follow the green line to reach the boss (red spot) and see if you can kill it dodging Death Spiral. There's a tiny passage where you can dodge his instakilling beam so use it for your advantage. Reverse yourself where the green spot is in order to make Dragon fllow you. When the beam vanishes get out of the passage and finish the boss. After that step back to safety and cube your Class Charm if you managed to kill him within 3 minutes. If no, restart the game and retry. If you're a procmancer, summon Shadows to make monsters pounce on them and use your weapon (preferably SSU Raptor Scythe) to kill everything with Massacre. Your killspeed will be slower but keep on trying till you kill the Dragon on time. Difficulty: Medium. Might require you several attempts to do this uberquest. Duncraig: Fortunately we have high defence and avoid which grant us survivability when we fight with Slain Souls in melee range. However there are two dangerous monsters who have ranged attacks. One of them is immune to poison and throws a seed that unleashes a poison cloud. The other one throws a barrel which will instakill you in most times (we have ~20% avoid so this is a chance that barrel does no damage). Barrels do not deal instant damage like those thrown by Monkeys in Act 3 thus we can use Angel of Death to leap out of danger before the barrel explodes. Your goal is to collect 5 sigils from Assur's henchmen (they are marked as target-like circles) and a Ring of Five which is oten dropped in Duncraig by a random enemy. Prebuff with Lionheart, Tainted Blood, Burning Veil and Bloodlust and follow the yellow path, creating Town Portals where the blue dots are in order to recover your corpse if needed. If you die to a barrel surrounded by a group of enemies you shall use the same strategy as for Ureh: lure monsters to the different direction naked, die one more time and pick up your main corpse safely afterwards. Prebuff with Burning Veil and Graveyard when you're naked. After creating Assur's Bane, stack 95% total fire resistance and 300 flat fire resists against Assur and Purify him to death (he has very low health so 4-5 total purifies is enough to kill him if you don't apply Open Wounds) in a red circle area. Difficulty: Medium (Annoying). There are two variants of the map, one of them having much more small areas where you cannot avoid a barrel thus if you don't escape through a Town Portal when you see a burning fuse you'll get instakilled. Yshari Sanctum: Full Rathma's set works great here. Fortress and Crucify procs deal WDM damage so all monsters with different immunities do not possess a threat. Mephisto boss is the hardest one. You must kill him before he summons lots of Veil Kings (some of them will die of your procs). If you can lure him to the narrow corridor, there will be no place for Veil Kings to surround you so you can kill Mephisto with ease. Chimaeras are also dangerous in a melee range so if you have troubles with them, respec to 1 pt Rathma's Chosen and use it on any minion. Kill all Chimaeras with Voodoo Shot from afar. Demon Lords are another subbosses to look out for. Their heroic shield is rather weak, so with different damage sources from the gear combined with maxed Dragonfire Oil you can defeat them quickly. Crossbow spec (as mentioned above) also helps here. For Baal you just need 100% Open Wounds or he will heal. Difficulty: Hard (Annoying). When facing Valthek you'll need to position yourself in a right way so you can both kill his Guards quickly and not be one-shotted by the boss when he teleports on you. Try to never get surrounded and not to lose your body inside the swarm of Guards. This is easier done on Multiplayer when you can rejoin and pick up your body in town. to obtain Fire Elementals who will serve you a shield against the boss. Don't forget to get 95% fire and poison resists and at least 400 poison and fire flat resists to be able to survive in Wretched Hive. Avoid dying! Difficulty: Very Hard (Annoying). I don't really favour this uber, because the boss can spawn with certain superunique modifiers like Magic Resistant, Fire Resistant or Stone Skin which make you pray for being lucky not to get anything that would make his resistanses drop less often. And considering how long the way to the boss is, the whole uber can become a total nightmare if you don't have much patience. Baal: This will be your first encounter with a Heroic Shield. Baal himself doesn't have any special attacks apart from Thundergod (buff that activates stunning novas from time to time). However he deals a lot of physical damage and capable of taking 1/2 of your hp in one hit. When Infernal Contraption is defeated, go to town and craft yourself a few pieces of gear (armor, gloves, boots, helm, rings) in order to reach -199 enemy fire resists. Add R.I.P. modifier to one of your rings, get at least -150% fire pierce, equip Inti RW and an amulet with Mythal proc and go for Baal. Your goal is to keep damaging him until more than 4-5 Shardspawns appear. In this case you'll need to kill them with Whirlpool/Parasite and go back for Baal when there are no minions left. I suggest to create a Town Portal right when you appear in the Worldstone Chamber and avoid dying near that portal. The most important thing is not to panic if there are a lot of Shardspawns surrounding you. In that case you have to move fast and keep an eye on Baal so you can separate Shardspawns from him and kill them all before you go back to damage the boss. Difficulty: Easy (Annoying). Put maximum points into Talon's Hold in order to get more survivability. The whole battle may take quite a lot of time thus can be annoying. Bull Prince Rodeo: If he's already spawned, lure him to the wall you see on the map. Rodeo has three abilities: Chicken Licken (homing chicken that deal physical damage), Hoof Stomp (nova that knocks you back) and Cow Rush (instakilling cows that run from north-west to south-east direction). 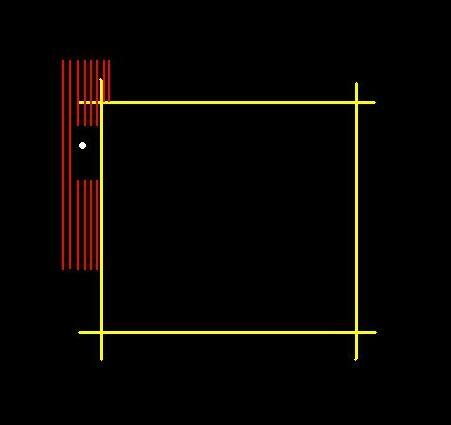 If you stand next to that wall (with BPR as the white spot) his Cow Rush (red lines) will kill you with splash damage everywhere but in the small gap as you can see on the map. You'll need to deal heavy elemental damage in order to kill the boss before he heals. This is achievable if you already have an access to Path of Flames oskill which deals huge fire damage per second. If you don't have such an oskill yet you can use Inti RW with the gear you were using against Baal. Just be sure you have -199% fire pierce. You can use SSU Raptor Scythe if you happened to get one before doing this uberquest. Difficulty: Easy-Medium. Drink a potion when you get hit by chickens. For attack use Shift+LMB in order to stand still and not to run into cows. Quov Tsin: Your goal is to get 400 fire/cold/lightning resists and 95% overall mentioned resists. Use crafted/honorific gear, socketed with Perfect Gems and don't forget to cube all gear with resists Mystic Orbs. When you do this, stack additional fire pierce. Put maximum points into Dragonfire Oil. When you get at least -150% fire pierce, try to get at least 85% poison and 300 resists if you can. Quov Tsin uses Hive that deals poison damage but this skill is not as dangerous as Trinity Beam/Nova that are used by the boss. Simply hit him and follow him when he teleports away. Difficulty: Easy. I used Inti RW against him. You can do the same. Be ready to go back to town at least once to buy more potions. Belial: He has four abilities: Punisher Barrage (unleashes punishers in all directions around him), Rattify (Crucify clone with rats instead of spikes), Blink (he teleports on top of you, summoning a pack of Henchmen) and Burn Nova (glowing sticks that quickly simphon you life to 1 when they collide with you). The latter two cannot directly kill you but in a combination with each other they are more deadlier than Rattify (we have a lot of defence and avoid to tank this). Henchmen are minions that throw punishers at you, so stack at least 85% total poison resists and 300 flat poison resists for this uberquest. Enter Icy Cellar, prebuff with Lionheart, Tainted Blood, Graveyard and Burning Veil (also with Path of Flames if you have it) and create a Town Portal. We want to either not have Belial spawned inside or have him spawned far away from the entrance in order to clear at least 2/3 of the level from heroic monsters. When it's done, summon Belial or taunt him to attack you. Execution should be done in melee range so be prepared to die a few times. Belial himself has a rather weak heroic shield so when he drops his fire resistance he will die very quickly. Using SSU Raptor Scythe with at least -170% fire pierce will be the best option, however Inti RW is a decent cheap choice against Belial. When the boss blinks on you, use Massacre/Parasite to damage him until you diefrom Burn Nova + Rattify combo. Your next goal is to distract Belial from your body by running to the opposite corner and die another time. Aster that pick up your gear, killing Henchmen that guard it and let Belial blink on you again. Repeat this strategy several times until the boss is dead. Do not use Angel of Death to escape from Belial because you'll most likely die on landing. Difficulty: Medium. 'Damage-die-pick up corpse-repeat' tactics may seem annoying, but in fact, it's very effective against Belial because: 1) he doesn't heal himself; 2) he also drops poison resists (Graveyard will deal additional damage); 3) corpse recovery is easy here. May take you a few tries until you succeed. 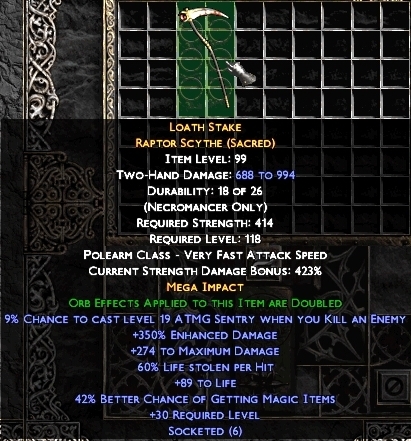 Farm him for 450+ life charm (450+ mana if you're a procmancer). so you can blink away and drink a potion in a dangerous situation. Difficulty: Medium. Not possible with a pure melee build as the boss knockbacks you a lot and summon minions who cast Tremor on death. She will teleport at you a lot, so you should find a way to blink away too. + rare staff to kill this boss with Thunderstone. If I find an easier strategy for an untwinked build (without obtaining that expensive armor), I'll surely post it here. Kabraxis: I haven't find a way to defeat him in a melee necromancer spec yet. Using crossbow skills is not effective due to the slow attack speed. Choose your main attacking skill - whether it be Massacre (great variant if you have a lot of 'on melee attack' procs); Parasite (great for leeching life and killing monsters from behind, perfect variant if you have a powerful 'on striking' proc) or Whirlpool (perfect for leeching life and activating 'on striking' procs, but has a spell timer). Choose between offensive and defensive playing. Check out skill trees and see what skill deserves most to invest hard points into - Talon's Hold (slow target, reanimates); Deathlord (free stats, damage); Famine (life leech) or Dragonfire Oil (flat fire damage). Choose between a dagger, a normal scythe and a necromancer scythe. Pick up what suits you most. Melee Necromancer can complete early and midgame without any summons (apart from two minigames and Legacy of Blood uberquest) so Minion Tree is completely optional to put points into. Bind some keys in order to prebuff yourself with Deathlord, Burning Veil, Graveyard, Lionheart and Tainted Blood in a matter of seconds. Use Elixirs of Experience and Shrines of Experience properly: activate them before you go to crowded/unexplored areas. All direct damage spells no matter if they are oskills or procs that have division values (e.g. 3/2 or 3/4) benefit from your total amount strength or dexterity. Direct damage spells that have fixed values benefit from Spell Damage/Energy/+all skills unless they have converted damage. If you see that you can do an uberquest but you lack some practise/time/luck while doing it, don't be lazy to create Town Portals now and then in order not to get frustrated (especially if the boss heals himself ) when you die and say that 'it is impossible to beat'. Early uberquests are doable with Tiered Uniques/mid-level Runewords/crafted items/honorific gear. Midgame and some endgame uberquests are doable with Rathma's set. There's no need to trade for perfect Natasha's Legacy to 'proceed further'. something else... if I remember about some things I wanted to add, the list will be updated. Rishab - for useful information. all users, whose maps were used in my guide. Thanks for reading! The guide will be finished as soon as I have more time to play MXL. Well done Stealth, guide looks great! I like how you present ideas / outlines for different types of melee necros so people can experiment with something that suits them the best. Great guide for my favorite character! P.S. I have a little messed up bbcode for skillplans, is any one have it too ? hellgrind wrote: I have a little messed up bbcode for skillplans, is any one have it too ?